Answering the big question, “What do I want to be when I grow up?” is something most people have thought about from a young age, and for some it is still a work in progress. Finding one’s true calling, or passion in life, comes from trying new things and putting ourselves out there to discover what sparks our interests. Bellevue College CE’s Web Design instructor, Mignonne Maxwell, has been on a remarkable journey of self-discovery having gone from student to instructor in just a few short years. Mignonne began taking classes, much like many other students, wanting to learn something new that would provide her with ready-to-use skills that could lead to a career opportunity. What she didn’t know, was that along the way she would discover a talent and passion for computers and web design. Before embarking on her new career path as a web design professional, Mignonne worked as a horticulturist for 25 years. “I had gotten to the point where I had exhausted that as a career and needed more.” She had an interest in computers, but had never taken any computer classes prior to attending BCCE. Her story is a great example of how someone can go from beginner to advanced, simply by having the determination and will to succeed. After 3 short years of taking classes and working full-time, Mignonne completed the Web Design Certificate in 2011 and landed her first job as a web developer in 2012. Within three years of receiving her certificate she had changed careers and was using the skills she gained from the certificate in her new roles. 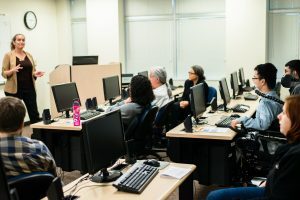 She went on to work in software application development which focused on the core classes she had taken at BCCE, and now she is a front-end developer and instructor at Bellevue College Continuing Education. One of Mignonne’s philosophies is that, “You can completely reinvent yourself by going and getting educated.” She recalls feeling confused at first, but her desire to understand and overcome the fear of not knowing is what got her through each of the classes. She loves coding and makes sure to tell her students that they will love it too, once they get the hang of it. Her enthusiasm for programming and teaching it to others stands out, and it’s clear that this is the calling Mignonne was meant to discover. Interested in taking classes with Mignonne Maxwell? Visit the Technology Programs page to look for her next class!